the women should keep silent in the churches. For they are not permitted to speak, but should be in submission, as the Law also says. (1 Corinthians 14:34). Paul was exhorting about orderly worship here. The women, who as Hebrews were not invited to participate in worship with the men or to be educated, were over-exuberant in their new found freedom as Christians. As a result, worship had gotten out of hand. Worship must be orderly, quiet, and respectful, that was the watchword. And Paul gave that word in this passage. Is there a time for a woman to holler and throw stools at the pastor? Apparently there was for Jenny Geddes. She’s gone down in Reformation History as someone who stood up for Jesus. Here’s how. 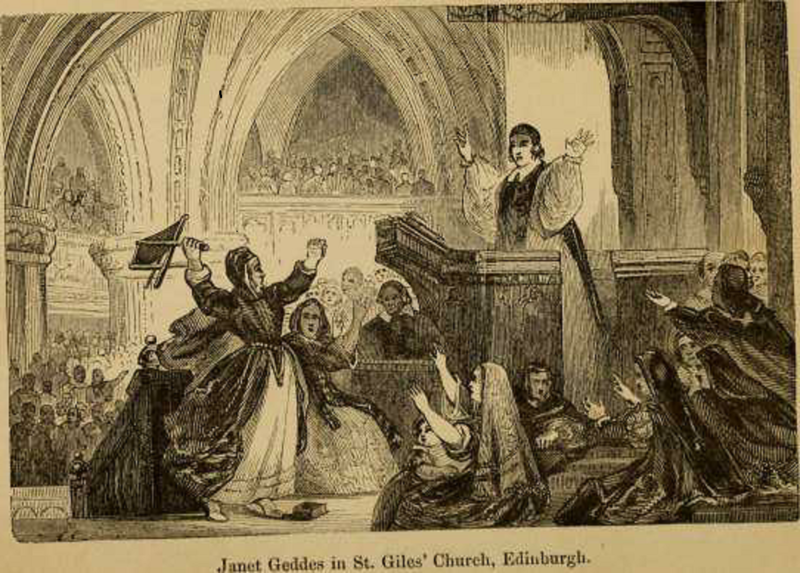 Jenny Geddes (c. 1600 – c. 1660) was a Scottish market-trader in Edinburgh, who is alleged to have thrown her stool at the head of the minister in St Giles’ Cathedral in objection to the first public use of the Anglican Book of Common Prayer in Scotland. The act is reputed to have sparked the riot which led to the Wars of the Three Kingdoms, which included the English Civil War. Well, that’s some stool. It all happened on July 23, 1637 in Edinburgh. Always independent, the Puritan Scots had become suspicious of the increasing encroachment of liturgy and rigid traditions a la the Roman Catholic Church. They had observed King Charles Is’ coronation rites and were displeased with his use of Anglican rituals. Next came forced use of the Book of Common Prayer, a high Episcopalian book, with its readings in the Apocrypha. King Charles issued a warrant in 1635 declaring his spiritual power over the Church of Scotland, insisting that the Church would be issued with a new book of liturgy which would be read at services. And on July 23, 1637 in St. Giles Cathedral, the Common Book of prayer was opened and John Hanna, Dean of Edinburgh, began to read. The national spiritual unrest was real, but overlaid upon the spiritual unrest was political unrest too. Hence the riots that sparked the Wars of the Three Kingdoms, and then the English Civil War. You can read about that part of the history elsewhere. On November 10, 2013, Memorial Church of the Reformation in the city of Speyer, Germany hosted Karl Jenkins’ performance piece, titled “A Mass for Peace- “The Armed Man” where as part of the performance, the Islamic call to prayer is performed by an Imam. Its construction was supposed to be a reminder of the protest action that the imperial evangelical states brought to bear in 1529 at the Reichstag in Speyer. The Luther memorial in the vestibule and the adjacent statues of local Protestant rulers serve as reminders of this event. Having no particular plan, she quietly listened to the music and readings, but when the Imam began praying to Allah in Arabic and saying, “Allahu Akbar!” she felt what she called a holy anger rising up in her. Much like Jenny Geddes, who was righteously aggrieved with the blasphemy in her midst, Mund stood up at this “interfaith event” and fearlessly began shouting that Lord Jesus alone is God and proclaimed His supremacy over all the earth. If we are confronted with something of like kind, what would be our reaction? There is a time to sit silently and submissively, but is there ever a time for disruption and holy anger? Jenny Geddes threw a stool, narrowly missing the preacher’s head. Physical violence is never appropriate. How would we react to the incursion of evil into a holy place, a place set aside for the proclamation of the pure word? Just food for thought. Both Geddes and Mund knew of what was to happen during the service. Neither were surprised. Mund prayed ahead, one can surmise that perhaps Geddes had also prayed ahead. In one way or another, we are all confronted with false doctrine creeping in. Start praying ahead for strength in the Lord to react in ways that honor and glorify Him. It was in the month of July — a month since become so memorable in the history of human freedom — on the twenty-third day of the month, that Jenny emerged from domestic obscurity to historic celebrity and renown. On that day there was a strange ferment throughout Scotland and a wild excitement in the city of Edinburgh. King Charles had resolved to make Presbyterianism give place to Prelacy throughout the realm. A book of canons had been prepared subversive of the whole system of Presbyterian government, and had been enjoined upon the realm by proclamation upon the king’s simple prerogative. Following this book came a liturgy as a law of public worship, and a royal edict had commanded its introduction into all the churches of the realm on this memorable Sabbath day. Notice to this effect bad been given the Sabbath before, and hence this intense excitement. For the Scottish people knew that if this measure were carried into effect by the authorities, Presbyterianism was virtually in its grave. As the hour of Sabbath service approached, the streets of Edinburgh were thronged with crowds of people — every bosom throbbing, every eye flaming with excitement. But whither were they directing their steps? Conspicuous from many a point in the city of Edinburgh is a lofty tower, terminating in an open, carved stonework, with arches springing from the four corners and meeting together at the top in the form of a crown. Already more than three centuries were looking down from that tower-top. It rose from the centre of a vast and venerable pile, including the High Church at the eastern end, There Knox so often preached, and within which pile “forty altars” were at one time supported. It was thither mainly the crowds were pressing, and among them Jenny Geddes. Not being overburdened with modesty, she elbowed her way through the crowd to a convenient place, her stool, in near proximity to the pulpit, and seated herself on her throne. The edifice was filled to repletion with titled nobility and the nobler untitled nobility of the Scottish Presbyterian masses. There were present archbishops, bishops, the lords of the session, the magistrates of the city, members of the council, “chief captains and principal men,” and Jenny Geddes and her stool. The excitement was becoming every moment more intense. The minutes dragged themselves along with tormenting tardiness and the suspense was becoming almost breathless. When the feeling was wrought up to its highest tension the Dean of Edinburgh made his appearance, clad in immaculate surplice, book in hand — the fatal book of the liturgy — the device of English Prelacy for the reform of Scotch Presbytery. The book was opened and the service begun. “Villain! dost thou say mass in my lug?’ and in another instant her three-legged stool was seen on its way, travelling through the air straight toward the head of the surpliced prayer-reader. The astounded dean, not anticipating such an argument, dodged it, but the consequences he could not dodge. He had laid his book, as he thought, upon a cushion — the cushion proved a hornet’s nest. In an instant the assembly was in the wildest uproar. Hands were clapped; hisses and loud vociferations filled the house, and missiles, such as the hand could reach, filled the air. A sudden rush was made toward the pulpit by the people in one direction, and from the pulpit by the dean in the other. On the retreat of the dean, the Bishop of Edinburgh took his place in the pulpit, and solemnly commanded the winds and waves to be still, but no calm followed. He was as rudely handled as his brother in oppression, and nothing but a vigorous onset of the magistrates saved his lawn and mitre from the rough hands of Jenny Geddes’ soldiery.